ICC hosts several Short Term Teams each year for those who want to spend a week or two volunteering at one of our project sites in China. The purpose of these teams is to support caregivers with additional activities, outings and playtime for our children and young adults. While specific activities will vary based on location and needs, each team member will have the opportunity to spend much of his or her day serving in one of our small group homes. We believe that what you take away from the trip will be at least as important, and life changing, as what you give while you are here. We hope that by engaging with our children, young adults, staff and volunteers, you will come to see with new eyes what it means to bring love, hope and opportunity to the abandoned and disabled, and even more importantly how you can play a role when you return to your home country. “Going on a Short Term Team was something I had wanted to do for several years. My fellow team members came from England, Australia, the USA, Canada and Hong Kong, and their occupations were varied, but each one brought valuable life and work experience. *Team dates and locations are subject to change. Please continue to check this site for the latest information. **Please note that team locations can only be confirmed closer to the team dates. Your patience is appreciated as we work with the field to ensure that teams are sent to project locations where their services are most needed at the time. Please contact your local office if you have any questions. Please note: this fee is non-refundable. This fee does not include your flight or any associated travel needs (passport, visa, insurance etc.) to and from your home to the team meeting point. *Adjusted fees as of August 2018 and are subject to change based on future exchange rate movements. These fees will apply for all new team registrations for all 2019 teams. Team fees for 2020 teams will be available by August 2019. Complete the Short Term Teams Application Form in full and submit it via email or by post to your nearby ICC office. If you live in a country where ICC does not have an office, please send your application to the closest office. Send in the registration fee along with your completed application form. Please note that this amount is non-refundable. Submit a criminal background check from your country of residence (if applicable). Please note your application will be processed on receipt of your non-refundable registration fee. Teams come to our projects with a huge range of abilities. 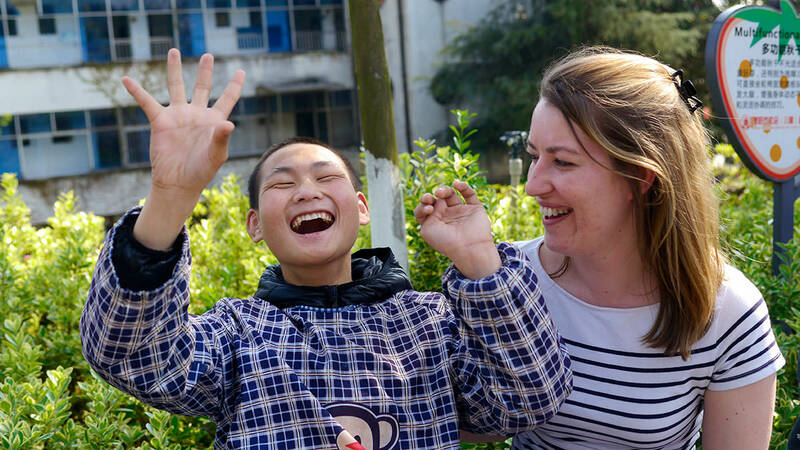 We do not require participants to have any special skills or qualification except for a heart to serve China’s abandoned and disabled children and young adults. Applicants should be over 18, but we will consider applicants under 18 if accompanied by a responsible adult. When can I go and for how long? ICC hosts about 5-7 short term teams per year and each service trip lasts about 2 weeks. You can check the latest short term teams schedule here. Where will the short term team meet? Short term teams will meet their team leader in Hong Kong for a time of orientation prior to travelling into the project. Accommodation is in western-style hotels. All rooms have full ensuite bathrooms with showers. Almost all your meals will be prepared from local, fresh ingredients. Chinese food is eaten family-style from platters shared at a table. Meals usually consist of a variety of vegetable dishes, meat dishes and rice. Depending on the location, the food can be spicy. ICC can arrange meals for some dietary requirements (very limited) – anyone with food allergies or intolerance must discuss this with the Teams Manager before deciding if they should go. What will my team and I do during our stay? 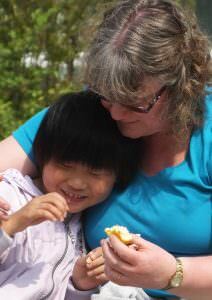 You will serve alongside people from around the world helping with a variety of activities. This may involve playing games, doing handicrafts, going for walks and joining in the activities organized by the caregivers. If you have specialist skills in areas such as medical care, occupational therapy, physiotherapy, speech therapy, art therapy, or related fields, you may have the opportunity to carry out more specialised activities at the request and with the support and supervision of a local or international staff on the ground. Your service schedule will allow for time with the children, as well as time for personal reflection and team building. Am I the right person to serve in China? You can come as you are. We don’t require you to have any special skills or qualifications to provide love and care to the children and young adults with special needs. You just need to be willing to serve those in need. We encourage groups of people who wish to travel and serve together to join one of the short term teams. What is an Express Team? An Express Team runs similar to a general short term team but has a shorter stay period (about 1 week).